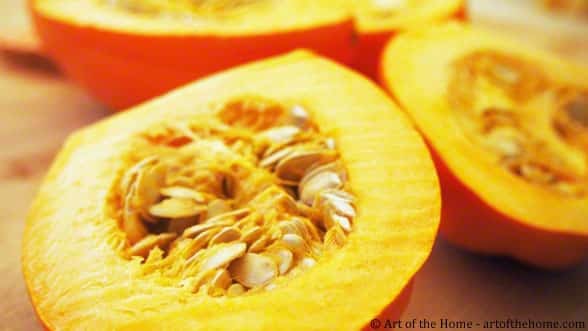 How about a spoon of fall with this soothing and nutty acorn squash recipe? Our “soupe du jour” (soup of the day) is a low calorie and flavorful acorn squash soup (soupe de courges). Acorn squash is a type of winter squash that looks like a teardrop or an acorn (hence the name). You may find them with green or orange skin but the inside is always orange. Our acorn squash recipe used orange acorn squash but feel free to use any type of winter squash you find at the market. Although, this soup is 100% vegetable, due to the texture of acorn squash, this winter squash soup is quite satisfying. Art of the Home acorn squash recipe is loaded with the great nutrients of squash (rich source of the essential and much needed Vitamin A). And adding this soup before your entree will certainly help you eat slow – a key step if you are trying to stay in good shape. 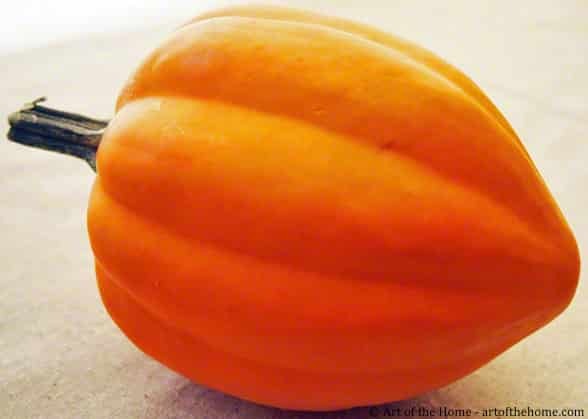 But if you are thinking to include this acorn squash recipe for the first course of your Thanksgiving meal (Art of the Home selection this year) – make it deliciously prettier by topping it with a spoon of creme fraiche to add some richness and a creamy texture to this fall soup. For large families, you can double up the ingredients. To save time, you can also conveniently make it ahead of time. Consider making it the night before, fill up a few canning jars once it’s done, store in the fridge and your first Thanksgiving course will be ready when you wake up on Thanksgiving morning – what a great way to start a stress-free Thanksgiving day! And if you are bringing the first course to a family gathering, just grab your jars and go – how easy is that? 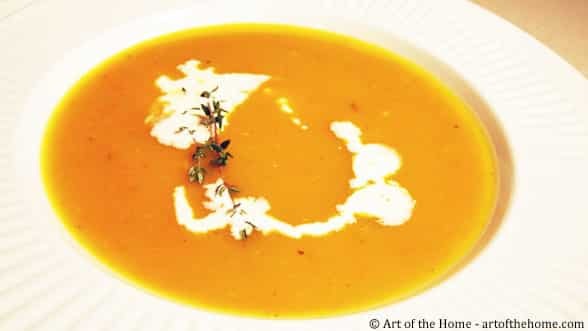 So check below for Art of the home detailed soupe de jour acorn squash recipe and Art of the Home suggestions. Simmering time is about 45 minutes but prep. time for this winter squash soup recipe is fast (less than 10 minutes) so it is a quick and easy soup to make anytime you want to see this gorgeous fall color in your plate. Enjoy and bon appétit! Peel and chop onions. Wash acorn and cut in half. Remove seeds and fibrous flesh (we scrap the inside with a spoon). Cut in chunks. Make a bouquet garni by placing 2 sprigs of thyme, 1-2 laurel leaves and one sprig of parsley inside a cheesecloth tied with cooking twine (you can also skip the cheesecloth and just tie your herbs without it but the cheesecloth does keep the herbs nicely packed together which makes it easier to fish out when you are ready to blend your soup). Sautee onion in a medium pot over medium-high heat for about2 minutes. Add chunks of acorn squash and cook over medium heat for about 5 minutes stirring from time to time so the acorn squash don’t stick to the bottom. 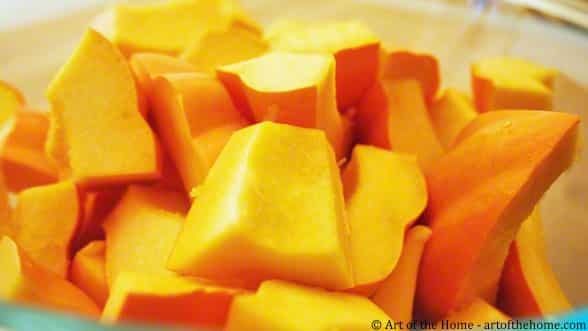 Pour water over squash (enough to cover the squash – about 1 liter) and add your beef base. Mix to dissolve. Add salt and pepper to taste (2 pinches or so) and your bouquet garni. Bring to a boil, lower heat and simmer covered for about 45 minutes. Remove bouquet garni and puree your soup using an immersion blender until smooth. Serve with a spoon of creme fraiche on top and add a sprig of thyme for decoration (optional). Enjoy! Delicious and appetizing choice for a meal starter during Thanksgiving dinner or to eat with a turkey sandwich the day after Thanksgiving. Quick and light dinner: toast some baguette, grate half of garlic clove on it, a yogurt for dessert, and voilà! Broth substitution: if you don’t have beef base, you can use 4 cups of chicken broth (homemade chicken broth, store bought chicken broth, or 4 cups of water with 1 bouillon cube). If you prefer, you can also use vegetable base or broth. Low cholesterol diet: this dish is prepared with olive oil so it is a great option for a low-cholesterol diet. Creme fraiche substution: you can use heavy cream if you don’t have creme fraiche.